A fun way to learn the importance of wearing one's glasses. An imaginative and interactive book both parents and children will love reading. Sally hated her glasses. One day she threw them and they became lost. She searched everywhere for them but couldn't find them. When strange footprints are found Sally becomes convinced the fairies stole her glasses. See how Sally's fluffy ginger cat brings them back. 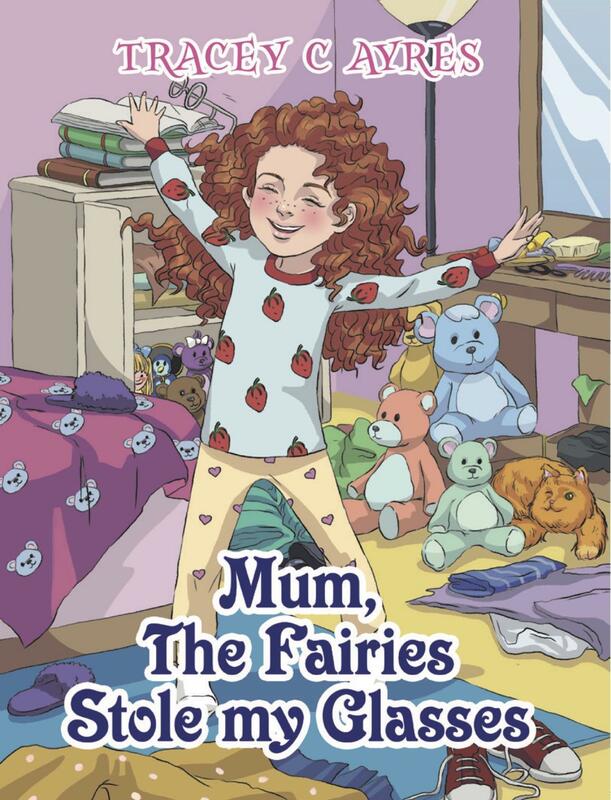 Mum, The Fairies Stole my Glasses by Tracey C. Ayres is a children’s picture book about the mystery of Sally’s glasses. The book started with the main character Sally waking up. As a matter of habit, she takes her glasses and puts them on. The book continues by showing how her glasses have helped her see things better in her room. Later, however, while trying to see which shirt to wear, Sally got frustrated because none of her shirts seem to go well with her glasses. As a result, she threw her glasses away and she went downstairs without them. While having breakfast, her Mom reminded her to put back her glasses. Though a bit reluctant, she went upstairs only to see that her glasses were gone. Have the fairies really taken them away? For what reason would they take it away from Sally? What will happen to Sally now that her glasses are gone? Will she ever have it back? This book can be very helpful for children who wear eyeglasses. Many times, children may not be comfortable enough wearing them. They may even be teased by peers because of having the need to wear them. However, this book enables children to learn the importance of wearing their glasses. In a fun and animated kind of way, it demonstrates how things are easier when they use them. It also helps them to see what will happen when they lose their glasses or when they refuse to wear them. The attractive illustrations in the book can easily grab their attention and help them to visually capture the lessons in Sally’s story. Aside from the valuable lesson about wearing glasses, this book also teaches the importance of organizing things. Many children find it hard to keep their bedroom clean and orderly. They may not realize how important it is to maintain an organized room in order to avoid losing their personal belongings. There is also a good use of imagination in the book. Though Sally has lost her glasses, she has definitely not lost her creativity. This is clearly shown in how Sally has presumed that the loss of her glasses could be the work of fairies. Furthermore, there is also a sense of mystery in the book. The family’s endeavor to search for the missing glasses is something children can enjoy in an interactive way with their parents. Parents can even ask their children relevant questions regarding Sally’s glasses. Do they really think that fairies stole Sally’s glasses? Who else could have taken it? What else could have happened to Sally’s glasses? Parents can then find out how rich their children’s imagination could really be! This is a truly enjoyable book for children and parents alike. Not only will they have a good time reading it, but they will also be able to benefit from the valuable lessons woven in the story itself. As Sally woke, she reached out and grabbed her glasses from the bedside cabinet. She pushed them over her nose and around her ears. Now Sally could see her bedroom clearly. She jumped off her bed and ran over to the mirror. Sally poke her tongue out at the mirror as she pulled out her clothes from the chest of drawers. She tried every t-shirt, but none of them went with her glasses. Sally took off her glasses and flung them away as she twirled around the room. An now, her t-shirts suited her just fine.